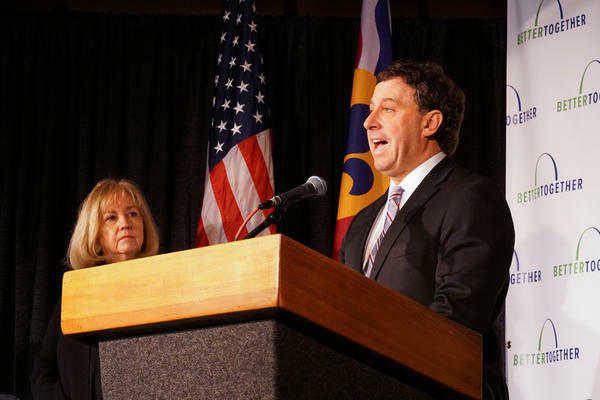 St. Louis County Executive Steve Stenger and St. Louis Mayor Lyda Krewson during the Jan. 28, 2019 reveal of Better Together's city-county merger proposal. It’s a conundrum of sorts for the Municipal League of St. Louis, a group trying to get roughly 20,000 signatures to prompt Krewson, Stenger and Gov. Mike Parson to appoint the board. Since Krewson and Stenger appoint 18 out of the 19 members, it’s possible their appointees may not put forward any plan — making the Better Together plan the only option before voters next year. While neither Krewson nor Stenger say they would intentionally take that path, both chief executives panned the municipal league’s move. "We have to make a change," he added. "And that change is not going to happen through the freeholder process." During a press availability with reporters on Thursday, Krewson questioned why the freeholders concept was being pushed now — even though the process has been in place for decades. Stenger pointed out that Missouri Constitution stipulates that any appointee to the board needs to get approval from the St. Louis County Council and the St. Louis Board of Aldermen. At least two members of the St. Louis County Council said the city and county’s legislative role in approving potential board members was important. Councilman Ernie Trakas, R-South St. Louis County, said the council has already scrutinized Stenger’s appointees to other county boards and commissions — and added they would take the same approach if the municipal league gets enough signatures. “So in that context, I believe there’s every chance that whoever does make it on the Board of Freeholders would be a person who cannot be and will not be controlled by any one person or entity,” Trakas said. During a council meeting late last month, Councilwoman Lisa Clancy, D-Maplewood, asked Kelly “why the Board of Freeholder process wasn’t more explored by the Municipal League prior to a week ago.” Kelly responded that he got the idea to jumpstart the freeholders’ process while writing a letter to the editor. “If they come up with some work product, I’ll give them my serious consideration, too,” added Clancy. St. Louis Public Radio's Rachel Lippmann contributed information to this story.